I like to joke that I was once "Hairdresser to The Gods". It's true, at least as far as this project is concerned. I was responsible for all digital hair for this TV commercial. Zeus, Hades, Poseidon, Athena and Kratos himself. 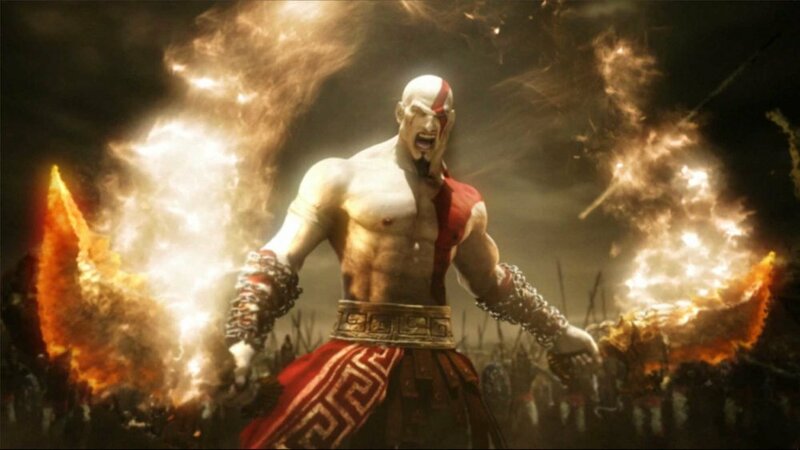 Yes, Kratos has hair. He would look pretty silly without his beard and eyebrows, thank-you very much. And for the HD super close up I also did stubble and peach fuzz for him. I remember vividly grooming his armpit hair one day and having a "my life is really surreal" moment. Sadly, you don't actually get to see any of the hard work I put into the hairstyles, as the final cut has the camera zooming past the gods at speed. I was particularly proud of the intricate plaits I did for Athena. Ho-hum. The biggest challenge on this project was Zeus' beard. At the time, hair plug-in's couldn't really simulate frizzy, air trapped hair with weights on them (his gold ringed plaits)- so myself and Joel Goodman teamed up to nut out a solution. Eventually we set up a system of splines bound to cached cloth simulations on volume meshes. Near the end of this gig, I jumped onto the cloth simulations team, getting Kratos' skirts flapping and dressing Athena. How many girls get to say they did that for a job?